Cameo is an absolute beauty. She is developing a very nice twist. 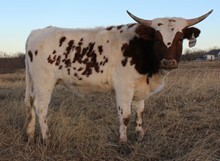 She has given us an awesome heifer out of our herd sire Game Point and, has been exposed back to him.